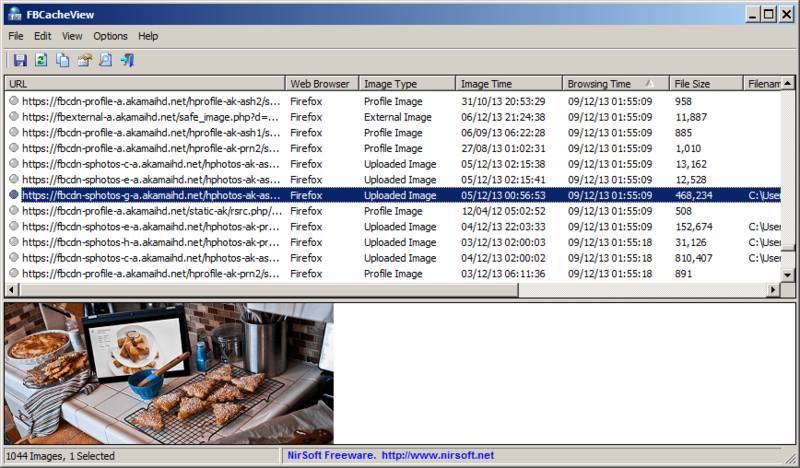 FBCacheView scans the cache of browsers on your system, listing all images displayed from viewed Facebook and Instagram pages. This includes profile pictures, images uploaded to Facebook, Instagram and images taken from other Web sites. For every Facebook and Instagram image, you can view the URL, Web browser that was used to visit the page, image type, date/time of the image, visit time, image file size and external URL (for images taken from another Web site). Note: FBCacheView won't work if you configure your Web browser to clear the cache after closing it. Works with Internet Explorer, Mozilla-based Web browsers and Chrome-based Web browsers (excluding Opera). How to extract: Download the ZIP package and extract to a folder of your choice. Launch FBCacheView.exe. FBCacheView now automatically detects the cache folder of Pale Moon Web browser. Note: Website shows a v1.10, but download is (presently) still linked to old v1.07.